Well hello there! If you had a chance to play this past week, we had an amazing turnout - so THANK YOU! If you didn't get a chance to, I hope you will soon! And a BIG CONGRATS to those receiving ShoutOuts this week... there were so many awesome entries, I decided we needed more featured ShoutOuts! Hope to see you back here in the morning for a brand new RetroSketch! Congrats Tracey! That's a fabulous card! Thanks for the shout out too. Looking forward to the next sketch! Congrats Tracey! Thanks for the shout out . Forgot to ask..is there an HTML code for the shout out badge ? Yay! Tracey, your card this week was awesome. Thanks for the shout-out, gals! 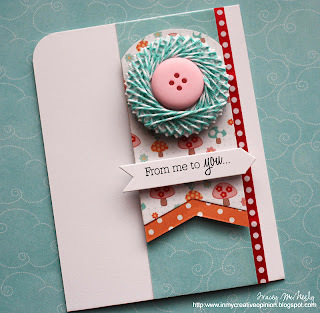 Thanks so much for selecting my card this week, I had so much fun making it. Congrats also to all the shout outs with their beautiful cards. There were so many, 68 actually, fantastic cards. Retro Sketches is really catching on. YAY Tracey awesome card girl!! Thanks for my shout out I loved this sketch!